sarawestermark: I love to work! I recently cleaned and organized my studio. Now I'm back to work and I love it! It really helps me to have a clean studio. I feel that it cleans out the cobwebs out of my brain. My sweet husband is to credit for getting me the shelves and the plastic bins for organizers! 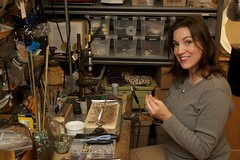 In this photo I'm working on a custom order for bluebird. I'm hoping to get my studio cleaned up today so I can get in some work tomorrow and feel good while doing it. Nice set up!